Coronary angiography is a procedure performed by cardiologists to accurately visualise the blood supply of the heart, the coronary arteries. 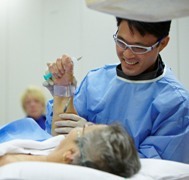 The technique involves injection of an iodine-based dye or contrast directly into the coronary arteries via a small tube or catheter. The test is highly accurate for determining whether or not your coronary arteries contain significant narrowings or blockages caused by a build-up of cholesterol-based plaque or atheroma. The procedure is performed in a cardiac catheterisation laboratory in a hospital with appropriate equipment and highly trained staff used to dealing with patients with heart-related problems. The cardiac catheterisation laboratory is quite like an operating theatre and during the procedure you will lie flat on an operating table however there will be an x-ray tube which moves around and over you. The x-ray tube is used to take pictures of the coronary arteries when the dye is injected through them. The x-rays are painless however do carry a small dose of radiation. Once you are in the catheterisation laboratory you will see television monitors, heart monitors and blood pressure machines as well as nursing staff, technical staff and medical staff. Small disks called electrodes will be placed on your chest and these are connected to leads which hook up to a continuous ECG electrocardiogram machine. This machine will monitor your heart rhythm during the test. To minimise the risk of infection, the access site (site where the small catheter or tube will be inserted into the radial or femoral artery) will be cleansed with an antiseptic wash and also shaved to keep the area clean. You will have an intravenous line in your left or right arm which allows administration of IV fluid if necessary as well as IV sedation if required to assist you to relax. The cardiologist will have made a decision as to whether the small tube or sheath which is approximately 2cm in diameter and 15cm in length will be inserted into the artery in the wrist (the radial artery) or the artery in the groin (the femoral artery). Prior to insertion of this small tube, the area is cleaned and then anaesthetised with local anaesthetic. The placement of the small tube into the artery should be painless although some pressure may be experienced. A cardiac catheter or long plastic tube is then gently threaded through the artery and into your heart. Two or three different catheters may be used during the test, which are shaped to accurately obtain pictures of the different coronary arteries and heart chambers. Dye or iodine-based contrast is then injected into the coronary arteries and x-ray pictures are taken from different angles to demonstrate whether there are any narrowings or blockages present. Towards the end of the test, a pigtail-shaped catheter is placed inside the main pumping chamber of the heart (left ventricle) and a larger volume of contrast is injected to demonstrate the strength of the heart muscle during the pumping process. This final picture usually gives the patient an unusual warm sensation which spreads throughout the whole body. At the completion of the picture taking process the catheter will be removed from the area of the heart and the sheath or tube in the radial artery or femoral artery will also be removed. Any bleeding from the access site will be stopped by either direct manual pressure from the nursing or medical staff or artificial pressure with a wristband or groin clamp device. In some cases, the groin artery may be sealed using a small closure device which allows for more rapid mobilisation following the procedure. In the vast majority of cases the procedure can be performed as a day case allowing discharge on the same day. If however you wish to stay the night in hospital, please discuss this with your cardiologist. 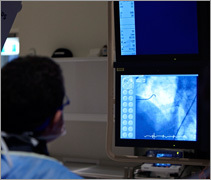 Diagnostic coronary angiography is considered to be a very safe test overall. The risk of a serious complication is very small. The small risks of the procedure will be discussed with you in detail before your procedure and you should ask your cardiologist if you have any questions regarding the procedure. The procedure is considered to be an accurate way of determining whether you have any narrowings or blockages in the coronary arteries and also then planning any potential further treatment which may be required.